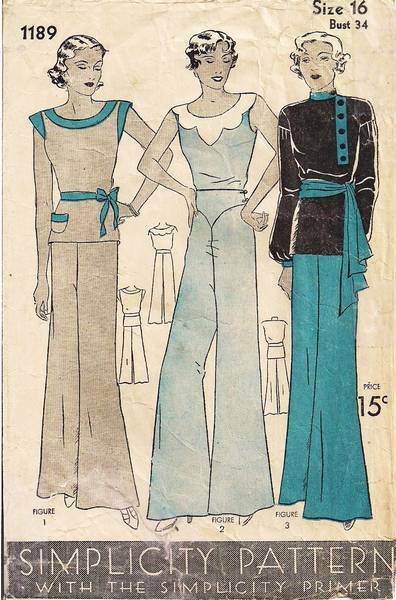 Vintage Simplicity sewing pattern from the very early 30's. 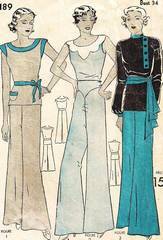 Misses Pajamas Trousers and Three Blouse Styles. Includes the Simplicity Primer, a step-by-step illustrated instruction sheet. Simplicity began in 1927 and this is one of their earlier, smaller envelope patterns measuring 7 x 4.5 inches. Size 16; Bust 34; Hip 37. Unprinted, precut pattern pieces with perforations. Pattern is used and complete. Pieces and instructions are in good useable condition. Envelope has wrinkles and some light surface soiling; one tape mend; uneven tear across bottom, as shown.